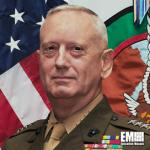 Defense Secretary James Mattis has emphasized diplomatic efforts to help the country’s allies stop North Korean nuclear threats during a joint press conference with his South Korean counterpart Song Young-moo, DoD News reported Saturday. He told reporters Friday at Joint Base Pearl Harbor-Hickam in Hawaii that he believes the regime of North Korean leader Kim Jong-un is a global threat that requires an international strategy to address the problem. “Our response to this threat remains diplomacy led, backed up with military options available to ensure that our diplomats are understood to be speaking from a position of strength,” added Mattis, a 2018 Wash100 recipient. He also noted that U.S. and South Korea support an “international economic pressure campaign” geared toward denuclearizing the Korean Peninsula.